Every facet of the MPC series has been refined and incorporated into the newest, most feature-complete film console available, the MPC4-D. 7 Dual-concentric knobs per channel, rich displays, long-life switches, premium faders, and lavish center-section facilities make the MPC4-D stand head and shoulders above the competition. The MPC4-D uses a new extruded aluminum frame with TFT waveform displays over every channel. 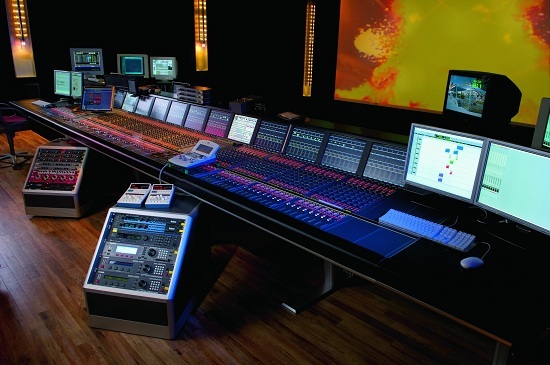 The surface is highly configurable, with an unlimited frame width to accomodate an unlimited number of faders. The massive DSP power available on the MPC4-D is provided via Harrison's revolutionary Xrange DSP system. Many hundreds of channels are available along with Harrison's industry standard Film Monitoring system and multi-operator IKIS Automation platform. 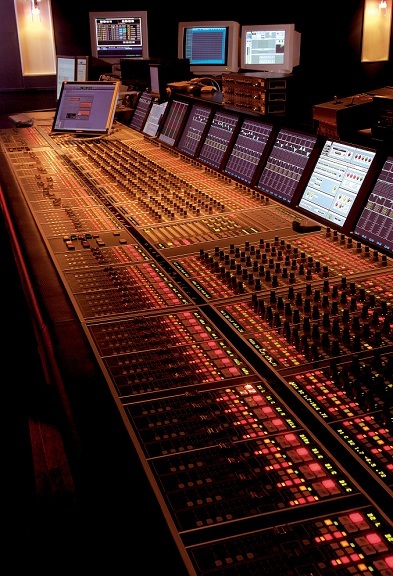 The total MPC4-D package provides limitless mixing potential for demanding users. Harrison MPC4-D Film Console at Universal Studios' Dub Room 4 (a.k.a. Alfred Hitchcock Theater) is shown here. This console has 384 processing channels, each with 2 inputs, 8 bands of EQ, full dynamics along with 64 bus limiters and 2 Digital Tools cards and extensive routing options. 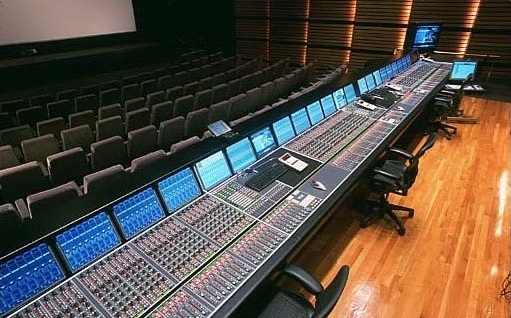 The console is over 30' long and has more faders than any single console in the world. Photo and text courtesy of Harrison Consoles. -64-bit processing using Xrange DSP. -Each channel has 2 inputs, 8 bands of EQ, Gate, Compressor, and 2 patches. -16-wide panning to 64 main busses and 16 auxes (typical, depending on configuration). -Complete signal processing: EQ, Dynamics, Routing and Panning available with NO allocation. -Xrange DSP plugins including "forensic" dialog cleanup, de-noising, de-essing, phone simulation and LFE enhancement. -Look-ahead Bus Limiters on every main bus. -Time-aligned throughput, even with multi-router, multi-engine systems. -Channel processing elements do not affect latency. -Comprehensive monitoring system including bus summing, Pec Direct switching, and speaker management.Up to 8 Pec/Direct panels per console. Full multi-operator functionality. -Harrison "In-Console" PreView™ waveforms with History. -A Harrison exclusive (patent applied for) Motorized, Touch-Sensitive Joysticks for surround panning - another Harrison patent. -Only the highest quality components are used in the MPC4-D.
-Built to ensure reliability and quality for many years.Multi-operator configurations using IKIS automation system. -Multiple control screens including satellite Machine Room Control. -Xrouter signal router, affording nearly limitless I/O and inter-process routing. -Efficient, traditional design means less keystrokes for critical functions, this provides more time for creativity.Xdubber stem recorder, connects directly to console for 32-bit predub recording. -Comprehensive AES (with SRC) and Analog I/O, plus MADI, ADAT and TDIF I/O. -Layering and profiling of channels into any configuration on the surface, including a mix of DSP and workstation channels, from 16 to 160 faders or more. -DAW control via IKIS Direct - Use the console faders to control dozens of DAWs simultaneously. -"Future Proofed" design allows your MPC to be upgraded to any future technology. Foundation text courtesy of Harrison Consoles. 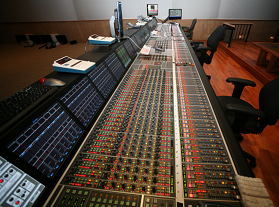 CinePostproduction GmbH - Studio A Harrison MPC4-D.
Harrison MPC4-D Console at Platina Music. Soundfirm Australia, has installed a Harrison MPC4-D console in its renowned Sydney mixing theatre. 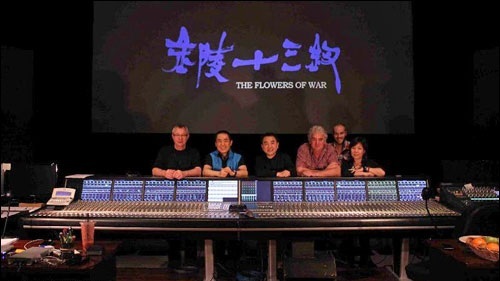 Left to right: Roger Savage (Sound Mixer), Zhang Yimou (Director), Tao Jing (Sound Supervisor), Steve Burgess (Sound Mixer), James Ashton (Sound Mixer), Geng Ling (General Manager, Soundfirm Beijing). Harrison MPC4-D Console at Sony Pictures - Stage 7. Do you have content, to add, about the Harrison MPC4-D Film Console or associated topics? Please feel free to Share it, here!